After looking at a ton of spanakopita recipes that were laden with enough fat to put a whale to shame, I decided to "freestyle" in the kitchen yet again and took out a bunch of ingredients that were not so kind to the hips. 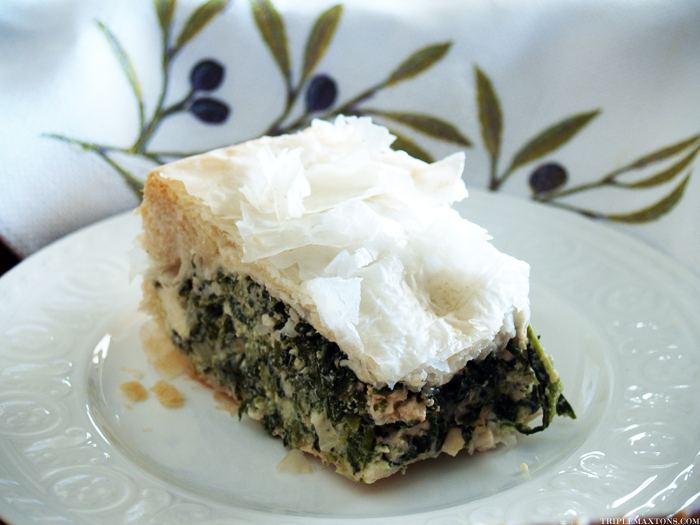 I have to say, my version is flavorful, light, satisfying, and relatively guilt-free.This is not your typical butter-filled spinach pie that negates the benefits of its good-for-you veggie namesake. Yeah....you're gonna want to go ahead and bookmark this recipe right about now. Defrost phyllo dough 2 hours ahead of time, then keep it cool until ready to use. Defrost spinach by placing in a fine colander, and let thaw. Press out as much water as you can. Mix cheese, eggs, salt, onion, leeks, herbs, and spinach in a bowl. Set aside. Melt the oil and butter in a small sauce pot. Using a pastry brush, generously grease up a square or rectangle cake pan using the butter/oil mixture. Gently unwrap the phyllo. Take the top half of the phyllo, and cover the rest until you are ready to use it (phyllo dries out quickly). Layer the bottom of the pan one phyllo sheet at a time, carefully brushing on the butter/oil mixture in between each layer. Be sure to let the pyhllo hang over the edges – don’t trim it off! Spread all the spinach mixture evenly over the phyllo, including the corners. Cover with remaining phyllo using the same method as before. Roll the overhanging edges and tuck them in around the inside edges of the pan. Brush the top with oil. Bake at 350 degrees for 50-60 minutes. Yeah...I need to make this. I love spanakopita so freaking much. Once I ate so much of it that it aggravated an unknown kidney stone and put me in the emergency room. And I still eat them! That's got to be true love. Or insanity.